Sat, January 26, 2019 10:00 A.M.
Before the printing press, hand-written manuscript pages were adorned with golden letters, decorative borders, and intricate illustrations. 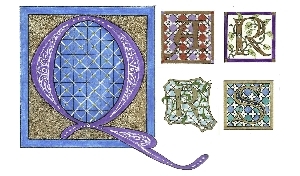 In this workshop, we’ll draw Medieval-style versal letters, “gild” them metallic gouache, and learn to decorate them with decorative borders and background designs that were seen in European manuscripts. No calligraphic experience is necessary for this class. If possible participants should bring a 2H pencil, a small pointed synthetic brush (size 0 or 1), and a black Pigma Micron pen in size 01. Meg Kennedy is a book artist and professional calligrapher who lives and works in Wynnewood, PA. She often uses medieval illuminations as inspiration in designing commemorative and award documents that are commissioned by academic institutions and corporate organizations. Samples of her work can be seen at www.book-arts.com. This free workshop will take place 10 AM - 1 PM in Room 405, 4th floor of the Parkway Central Library.